Dinner with the Doc: Stem Cells | Pasta House | Words | Style Weekly - Richmond, VA local news, arts, and events. 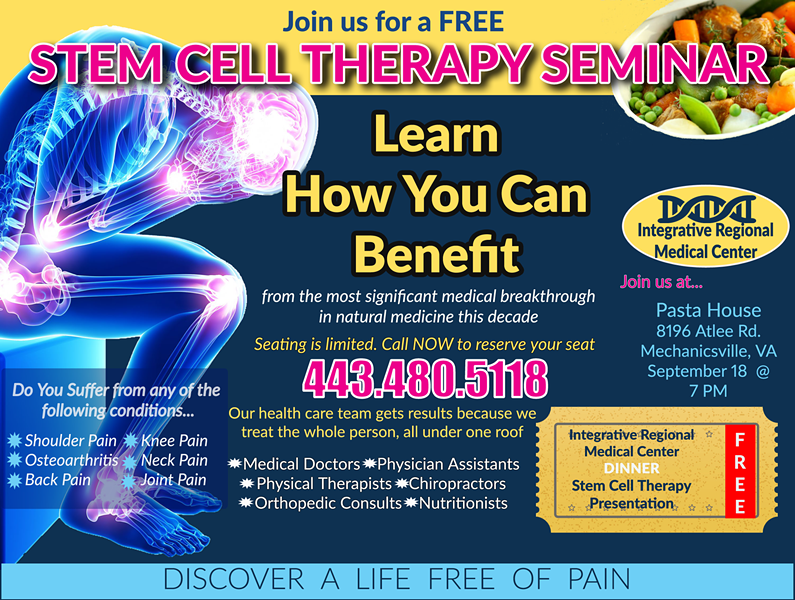 Integrative Regional Medical Center would like to invite you to hear about the miraculous regenerative stem cell treatments offered at their new clinic located at 7481 Right Flank Road, Suite 100 in Mechanicsville. This is a limited seating event. Dr. Stephen M. Erle will provide dinner and a thought provoking presentation on Stem Cell Therapy. You'll see how conventional approaches to Knee, Hip, and other Joint replacement surgeries are costly, ineffective, painful, and expensive. You will get the facts on how Stem Cell Therapy is a non-invasive, painless, and proven successful means of regenerating injured tissue, tendons, and ligaments.